Portable filtration units are ideal tools for flushing new machinery, remediating contaminated equipment, or periodically decontaminating systems with insufficient on-board filtration. We offer sturdy, maneuverable Des-Case filtration units for taking filtration to the equipment that needs it. Des-Case Filter Carts allow you to allocate filtration capacity where it’s needed most. You can also customize them extensively for your applications. Choose your own filter, strainer, and sample valve options, as well as flow rate, power configuration, connections, color, and more. The standard model covers a broad range of needs, but choose the heavy-duty TC Series cart for large reservoirs, high system flow rates, or non-mineral-based oil. 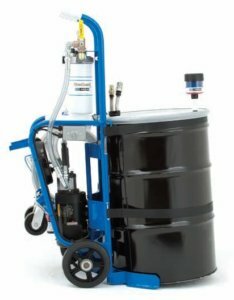 These rugged, powder-coated carts are convenient ways to pre-filter, transport, and dispense oil, as well as flush or decontaminate your system. Secure one of your oil drums on the cart with the adjustable, heavy-duty straps and spring-loaded clips. Then attach the adapter kit with included desiccant breather. You are now ready to transport your oil or purify it with the dual-stage filtration equipment built right into the cart. 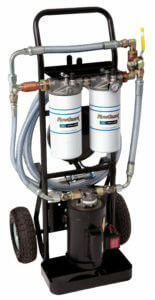 Filter Products Company provides convenient, portable, handheld drum toppers for fluid filtration. Carry one of these device anywhere, set it on a drum, connect it, and then let it filter as you transfer oil or fill small totes. These Des-Case devices can be heavily customized with options for strainers, sample valves, bypasses, flow rate, power configuration, connections, color, and each of the dual filters.